Happy New Year, everybody! We spent New Year’s Eve at home in our pajamas watching Luke Cage on Netflix with our pups snuggled up beside us. Well, beside me; they didn’t leave enough room on the sofa for Kyle. 2016 was quite a year and I’m hoping 2017 will be even better. Originally we had planned on renovating our kitchen this year but as of right now it’s been moved to 2018. Instead we’ll be tackling some smaller projects and potentially continuing our on-going exterior projects. It doesn’t seem like a big list but I think the built-ins may be a little tricky to figure out. I want the top half to consist of shelves and the bottom to be all drawers, including a custom drawer the folds out into a puzzle table. Let’s hope Kyle and I don’t strangle each other trying to figure that one out. Eventually we’ll also get new windows and add recessed lighting but we want to do all of the windows in the house at the same time, if possible and we’ll do the lighting when we do the kitchen project since we’ll be doing a lot of electrical work then. We also want to get new furniture and add a rug at some point but for now we’ll work with what we have. This will definitely be the larger of the two room makeovers. Our bedroom is huge but otherwise not much to brag about. I love the vaulted ceilings but everything else is meh. The room was a yellow/beige when we moved in and I finally broke down and painted everything white. I also made a headboard and we made our closet into a little nook. We recently bought new night stands (not pictured) to replace the DIY fails we had but this room needs a little demo and a lot of love. I would love to build some faux beams in here at some point to match the ones in the living room, add another set of windows, and install overhead lighting and a couple of ceiling fans to help with air flow. Also on the “Eventually” list: upgrade to a king mattress, buy a new bed (upholstered or wood), buy a big rug for under the bed, and add a seating area. We’re planning on getting started on this project soon. Kyle wants to get the garage organized first which will be easier now thanks to the work bench/tool chest we just bought and he needs to check out the HVAC situation before we start tearing the closet down. We already have the sconces, paint, and flooring and I ordered the underlayment for the floors today. Finish demo on the master bathroom. Well, this is embarrassing. 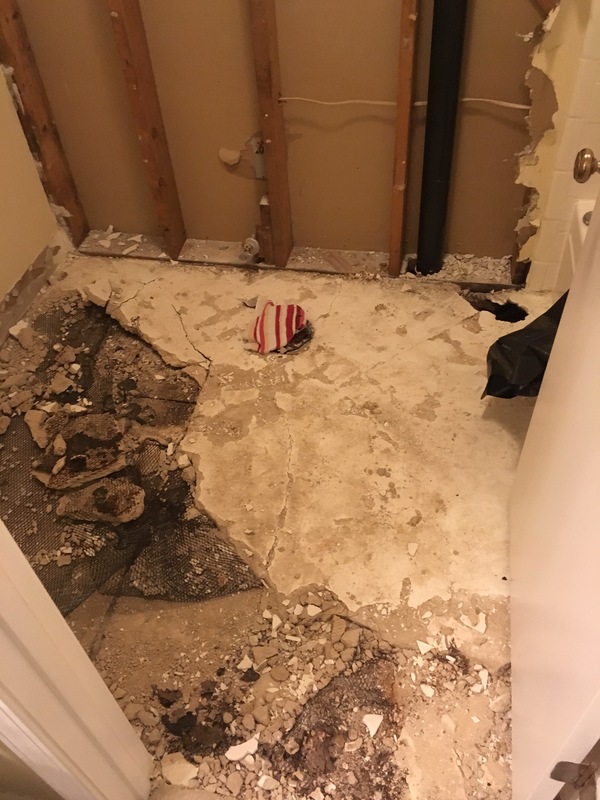 Kyle started ripping out our master bathroom floor earlier this year when we noticed water damage in our garage ceiling but other things became priority and so our bathroom floor still looks like this. See that hole in the upper right corner of the floor? That’s where the floor completely crumbled when Kyle was prying up the concrete. We’re lucky to have a functional hall bathroom that we’ve been using but I’d really like to at least finish demo on our master bathroom. We’re unsure at this point if we’re going to spend money on a band-aid makeover or if we’re just going to do without that bathroom until we can afford to do the big remodel we’re planning on. We have a small linen closet at the end of our upstairs hallway that drives me crazy. It’s not totally offensive but the bi-fold doors are constantly coming off the track and it’s not even a little bit organized. We’re planning on taking the doors and tracks out, expanding the opening, and doing more of a built-in situation with shelves and drawers. We don’t really have a set plan for this as far as timing goes but it will most likely be in the second half of the year. We also have a few “maybe” items on our list if we have the time and money to put toward them. Finish the deck and fence. We’ve been working on the fence and deck in phases. So far we’ve built half of our deck and two parts of our fence and if possible, we’d really love to finish both this year. The nice parts of the fence make the lattice look even worse and I know the dogs would love to have even more space than they have now. Our foyer needs some work. We have one wall that’s partially spackled, partially fuzzy from my failed wallpaper removal attempt, and partially painted. We talked about doing board and batten but I’m unsure right now. We definitely need to fix the fuzzy wall, re-paint, and redo all of the trim. We also want to buy a new rug and entry table. We’ll add recessed lights whenever we do the kitchen and we did the floors last year.The “progress” picture here isn’t current; we’ve switched out the door since then and our entry table is currently naked. We also want to build a set of barn doors for the area leading to the bathroom/laundry room. This will give some more privacy for the bathroom and it will allow us to remove the door to the laundry room which will make carrying groceries into the house through the 5×6 space so much easier. This is going to be an on-going thing but I really want to start saving up and investing in nicer furniture that’s going to last a little longer than our Target and Costco pieces. I’m not saying we’ll never buy cheap furniture but I’d like to start getting some nice pieces. So far, we’ve talked about getting something like this west elm console for our entryway instead of just building a new table. Be more social/invite people over more/go out more – The introvert part of me is hating me for this but the small extrovert part is cheering loudly. We’ve already purchased tickets for 3 concerts this year, I’m planning on going out for Taco Tuesday with some lady friends tomorrow, and I want to try to host a few dinners/parties this year. I used to host dinners and parties all the time but haven’t felt like it much in the last year or two. Be active – I was active most of last year but after my half marathon in September I pretty much became a couch potato. Hopefully I’ll start running again this week.